Backup in Windows 8 is tricky. It’s not similar to usual file-and-folders or disk-to-flash-drive backups: there are system files “locked” by Windows 8 operation system, so simple “copy-paste” backup software will not work. There are built-in tools in Windows 8 for making backup of the operation system, but they are not ideal in many situations. Large disk space and time-consumption. Windows 8 backup usually takes a lot of space. Thus, you need a big disk to fit it and a considerable time to complete the backup. If you are going to do a cloud backup, you will also need fast Internet connection. Because of that, differential backup technologies are becoming much more relevant for Windows 8 backup - it’s a good way to save a lot of space and time. But that technology is not presented in Windows 8 by default. A special software for restoring. Windows 8 as well as other operating systems can be saved directly while working (even system files) with a built-in Windows 8 backup software. But if you need to restore the system, you will not be able to run a recovery program on non-working operating system, so you will need a software to boot in recovery mode. No “System Image Recovery”. Windows 8 has a new solution for a backup called “File History”. In Windows 8.1, old Windows backup tools are no longer presented. Windows 8.1 allows you to import your old backups from Windows 7, but you can not create a new backup using the function “System Image Recovery” (recovery from a system image). So if you want to create a system image backup or do a recovery from the image, then you have to use third-party Windows 8 Backup Solution. Your computer is not good enough for Windows 8. Windows 8’s system requirements are not much higher than Windows 7’s, but if your Windows 7 system is running “at the limit”, you may encounter troubles. Your software and hardware may not be compatible with Windows 8 system. Some software may not work properly on the new system (even if it’s formally supported). There are a lot of changes (for example, in the file structure) in Windows 8. Also you need new drivers for your hardware. If your equipment is quite old, you might find no drivers. If you select migrating from Windows 7 to version 8 via upgrade, the system will automatically save all the settings, applications and data. However, the old data (you in fact no longer need), will also be saved and will “eat” your disk space. Because of that many people select Windows 8 installation “from zero”. It requires making preliminary backups of all important data and drivers. You will be able to use them when needed. Planning 7-to-8 Windows migration? We have a perfect solution here to do all required backups. There are many Windows 8 backup programs. We are sure here at Novosoft, that Handy Backup is one of the Windows 8 best backup software. The amazing fact is almost every Windows 8 backup feature worked perfectly right from the start and no error correction was required so far. Well, not that amazing; Handy Backup’s got software architecture legendary for its handiness among other Windows 8 backup programs. Try Standard edition of the software to explore the simplest way to perform backup of Windows 8 files. Free 30-days trial version! Disk image. Windows 8 disk imaging is one of the most preferable and efficient methods of data protection. 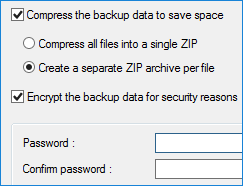 Software also lets you to do a “file and folder” backup assumes the data is restored through the file system. Full automated backup. 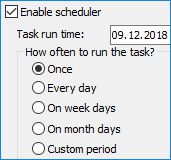 Use the simple scheduler to set up the automatic backup tasks. Running as a Windows 8 service, the software do regular backups instead of you! Any type of backup. You can perform all types of backup (full, incremental, differential and mixed backup). It’s very important because of the size of Windows 8 backup. The use of the technology also includes significant speed increase. Remote backup. The best Windows 8 backup solution for keeping your data safe is putting the backup to the external drive or cloud storage. Handy backup has a lot of options for this. Safe and secure. There is an encryption and password protection. It’s your choice if you want to increase the security. The program will help you to keep the information private. Disaster recovery. If you are looking for the best Windows 8 backup software, don’t concentrate on backup only and always remember about restoring. Handy Backup has a special recovery module that you can use to boot from for restoring the system. Interested in leaning more? 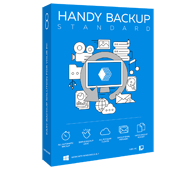 Download Handy Backup and get the simple and efficient first-hand best Windows 8 backup software experience!